So happy to finally get back to blogging. A long stretch of influenza and some unrelenting coughing caused me to take a two week break from the webinars. However, it seems that a person can actually cough and type without too much effort, so I thought I would write to you ladies instead. For a while now I’ve been observing a heart of stone in one of my loved ones. It breaks my heart over and over again, to see someone once so filled with love and zeal for the Lord now so bitter, angry, and stumbling around in the dark. I have talked, cried, prayed, fought, begged, and pleaded with God for months, and then finally I stopped. It might have looked like surrender on the outside, and I even uttered the intention of surrender to a few friends, but only God knew what really happened… my heart became hard as well. You may know exactly what I’m talking about. We can not deny the fruit of a hard heart. According to Luke 6:45 “A good man brings good things out of the good stored up in his heart, and an evil man brings evil things out of the evil stored up in his heart. For the mouth speaks what the heart is full of.” My mouth was clearly speaking what my heart was full of. I’m especially referring to that anger, strife, bitterness, complaining, fault finding, nagging, controlling, manipulating, and gossiping that goes on behind closed doors. Sometimes the crust around our hearts become so hard that this even spills over into public places, but for the most part our hard heart shows best when our guard is down, in our own homes. After a few days of this the crust around my heart started cracking slowly, and finally, I found myself weeping like a little baby, because I SAW!! How could I not see this before? I saw how I’ve allowed the sin of others to harden my heart. I saw how I’ve grieved the Holy Spirit, and how I started relying again on my own plans. I wept tears of sorrow, repentance, and forgiveness. His Word not only washed me clean, but the Holy Spirit started soaking the soil of my heart, like a steady autumn rain. And then, ever so gently, He started removing every hook of idolatry and evil desire, and plowed the soil so the seed of His Word can grow. Oh my dearest friend, there is nothing like a heart that has been softened by the Holy Spirit. IT IS A TRUE MIRACLE! No human can do it, or even imagine it. When the Holy Spirit softens your heart it flows out of your mouth and your pores! You can not contain the love and the joy, and you stand amazed at the peace in the midst of terrible circumstances! A soft heart desires more soaking, cleaning, and plowing in God’s presence. You don’t need to coax it! A soft heart never hold hooks of idolatry or evil desires for long. The ground is simply too soft for anything but the Word of God to take root. The miracle of a soft heart is available for all God’s children. He wants to wash you clean in the water of His Word, and the Holy Spirit is ready to minister to you, helping you to turn your back on the things that grieve Him. I’m praying during this Holiday Season that each person who reads this and needs the miracle of a soft heart will come to Jesus and be changed in His presence! But whenever anyone turns to the Lord, the veil is taken away. Now the Lord is the Spirit, and where the Spirit of the Lord is, there is freedom. And we all, who with unveiled faces contemplate the Lord’s glory, are being transformed into his image with ever-increasing glory, which comes from the Lord, who is the Spirit. Read my story. 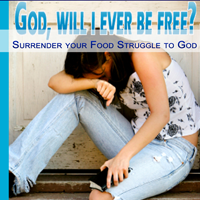 Click on the image below to download my ebook: God will I ever be free? Appetite for Freedom WORKBOOK and DVD. Great resource for small groups or for individual use. Wow, Heleen. Thank you for your honesty. I can imagine how the enemy must try to keep you from sharing your struggles with us. How easy it would be just to work out your issues with the Lord and just leave it there so as not to expose your weaknesses to others. Yet, you do exactly what the Lord would have you to do…share those struggles with us and point us to the Way, the Truth, and the Life. Thank you for bringing glory to the Lord. Thank you for allowing God to heal your hard heart and to keep you low so you can send us this message. I will not wait to ask God for this cleansing. My problem is anger because my husband is angry and I answer him in the flesh. I will talk to God today. I pray for your healing and a blessed Thanksgiving season …we have sooo much for which to give thanks. Today I give thanks for you and this message. May God bring much joy and healing and hope to you. God bless you. So in need of the miracle you describe here. your prayers on my behalf. I praise GOD for your renewed softened heart! Thank you so much for sharing your testimony with us. It keeps us so humble and I thank the Holy Spirit for showing you this revelation. I pray for a speedy recovery to you.